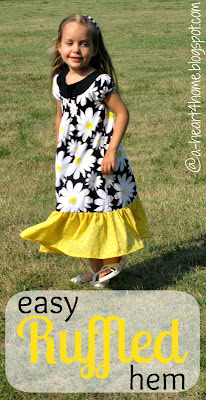 Our oldest daughter, Emahry, loves to wear dresses. For some reason she's convinced that long dresses equal fancy dresses...not that we're complaining about that at all! So, what do you do when little girls grow taller and their dresses don't magically grow too? Or when someone gives your little girl a dress that is already too short for her (or your) liking? In our house, those scenarios are often fixed by an appointment with my sewing machine and a pretty new ruffled hem. When a dress or skirt needs lengthening I typically head to my fabric stash first to see if I already have something that coordinates. If not, then I'll wait until I have a couple pieces that need fabric before I make a trip to the fabric store. Four kids in tow helps deter me from becoming a Hobby Lobby regular. Whether I find fabric in my stash at home or have to go to the store looking for it, there are a few criteria I'm looking for. I also make sure that I have enough fabric to make the ruffle strip 1 1/2 or 2 times the width of the bottom of the dress depending on how "ruffly" I want it to be. With Emahry, the more "ruffly" the better, so I tend to double the bottom width of the dress most often. 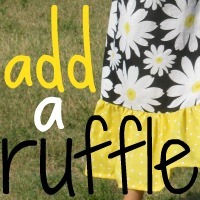 The ruffle fabric should also be the same type of fabric as the dress (or skirt) itself. If I'm working with a cotton dress, I'll add a cotton ruffle. If the dress is knit, I add a knit fabric and so on. Before going to the store I figure out how big I want the ruffle to be and add in my seam allowances and hem. Then I have the fabric cut slightly larger to accommodate crooked cutting and possible shrinkage. Usually I only need somewhere between a quarter and a third of a yard, so the cost is fairly minimal. When I do go to purchase fabric I take the dresses (or skirts) with me so there's no guessing about color while I'm at the store. I normally just hunt down a sales associate when I go in to let them know that I'm bringing some items to match. I also read the fabric labels at the end of the bolt to make sure I know what I'm getting. It may help to write down the care instructions to refer to later. *Make sure you also have matching thread for the ruffle fabric. I think it's very important to prewash all new fabric before sewing. There's nothing like spending precious time making something and then having it shrink the first time through the wash. I simply prewash all fabric on the same setting the finished garment will be washed in. If I have any doubts, I play it safe and run it through on the hottest setting for the type of fabric. Once it's dried, I press the fabric to get out any wrinkles. Then I fold it back in half (like it was at the store), make sure both edges are straight and cut the fabric to the width and length I need. I also make sure to cut off any edges that frayed in the wash. I like to have two long rectangles, one for the front and one for the back of the dress. Since I don't own a Serger, I like to use french seams to keep all the raw edges contained. To do this, place your ruffle pieces with wrong sides together, then sew these two pieces together along the short ends using a 1/4 inch seam allowance. Next, flip the fabric the other way (right sides together) and enclose the raw edges of the first seam. It really helps to iron now to get the seam to lay flat. Now sew both the short ends with a 1/2 inch seam allowance. Then open it back up and those raw edges are nice and neat with no fraying. Iron both of the seams open and flat. Next hem the bottom edge under. I like to fold over a 1/4 inch and then another 3/4 inch to get all of the loose strings enclosed. Now that we've taken care of all of the other edges of our ruffle fabric, it's time to gather the top. Ashley @ Make It & Love It has a very detailed tutorial for gathering and attaching a ruffle so I won't try to reinvent the wheel here. I use the "short-cut" method most of the time although I do prefer the look of the correct method. I attach the ruffle to the bottom of the dress the same way that she attached the gathered ruffle to the tube. Scroll down until you start seeing pictures with the orange polka dot fabric. 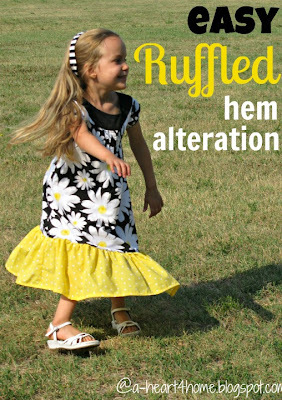 Now that you've attached the ruffle to the dress, trim any loose threads, sit back and let that little girl twirl. 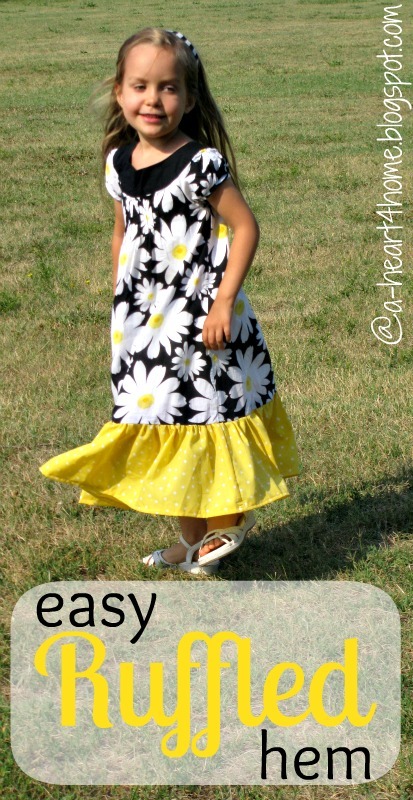 This project will be entered in Kristin's Summer Dress Challenge. 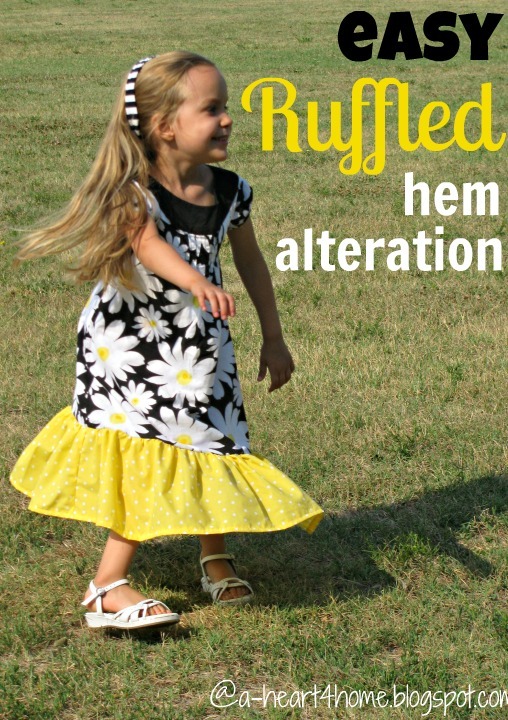 Today's Questions: Have you ever altered clothing for yourself or your children? What's one way you've changed a piece of clothing to make it work for you? Thanks for adding another submission. Is it okay for me to use one of your photos again? My mom used to do that back when I was a little girl! I think many times it actually makes the dress look even cuter than it was originally!